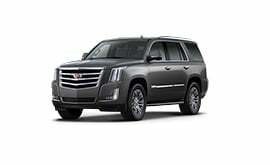 The 2018 Cadillac Escalade - Premier Chevrolet Cadillac Buick GMC Inc. The 2018 Cadillac Escalade is, and always has been, the ultimate luxury SUV. Often copied, never imitated, the Escalade oozes class; coupled with the superlative craftsmanship and incredible features, the 2018 Escalade is a tough act to follow for others in the segment. So, if “Escalade for sale Ontario” was your last Google search then the Cadillac dealers in Ontario, Canada could not be more proud to present to you the 2018 Chevy Escalade! You can view our in-stock Cadillac Escalade inventory here. The 2018 Cadillac Escalade is a powerhouse of an SUV, fitted as standard with a 6.2 liter, 420 horsepower engine. Torque is abundant with this powertrain, measuring in at an impressive 460 lb-ft, you’ll make light work of towing boats, horse trailers, you name it, with 8300 lb towing capacity included with the as standard trailering package, there isn’t much you can’t tow! The Variable Valve Timing provides efficient power delivery and excellent torque across the rev range, giving this large vehicle excellent pickup both around the town and at highway speed. For a large SUV, the Escalade feels incredibly nimble, managing 0-60 miles per hour in just 6.1 seconds. The power is transferred to the road via the intelligent 10 speed automatic transmission with manual gear selector mode for total control. Helping with both handling and comfort is the available Magnetic Ride Control system. This incredible suspension reads the road up to one thousand times per second for incredibly responsive adaptation to changing conditions. This amazing technology, first pioneered by Cadillac, utilizes magnetically charged fluid in the shocks. Different road conditions cause the fluid to react in different ways, changing how it behaves, and resulting in incredibly responsive performance. Of course the Escalade is available with a 4 wheel drive system, however this being a Cadillac, it is of course a smart 4 wheel drive system; leave it in auto mode for seamless transitions between 2 and 4 wheel drive, maximizing fuel economy for every day use. The 4 HI mode assists with keeping traction when conditions are bad, and when conditions get even worse, 4 LOW mode can help to get you going. The Stabilitrak traction control system keeps things steady on unstable or slippery surfaces through automatic application of brakes and reduction of torque where necessary. As you would expect from any Cadillac, luxury, refinement and superb craftsmanship are of course par for the course. The flagship Escalade is all about exceeding expectations, and achieving automotive perfection, it is an SUV experience unlike any other. The cabin is appointed with superlative materials, of only the very highest quality. Natural materials such as wood, and top grain leather are the order of the day. What good would it be to sit in such opulent surroundings if it wasn’t comfortable? Of course this is a non-issue in the 2018 Escalade, comfort is of course high on the priority list, and not just for the driver and front passenger. You’ll find thoughtful touches add to the overall experience through the cabin; heated steering wheels, heated and ventilated front eats, heated rear seats, and three zone climate control ensure that all passengers are catered for, no matter where they’re sitting. The adaptive remote start gives incredible control over your Escalade, even when you’re not in it! By using remote itself, or the MyCadillac app on your compatible smartphone, the engine can be started and the cabin can be preconditioned based on the outside temperature, ensuring a comfortable drive from the second you step aboard. The 2018 Cadillac Escalade also features keyless access, allowing you to open the vehicle without removing keys from pockets or bags. The luxury doesn’t stop with materials and convenience features, the 2018 Escalade comes as standard with the amazing, 16-speaker Bose Centerpoint Premium Audio System providing a complete surround sound experience. With top quality definition, augmented by the triple sealed doors, acoustic front glass and the Bose Active Noise Cancellation system, this luxury sound system makes background noise a thing of the past. For most people who choose a vehicle like the Escalade, both luxury and space are requirements on the shopping list. Fortunately both boxes are quickly checked. The spacious trunk is quickly expanded at the touch of a button thanks to the power folding third row seats, which, when flattened expose an additional 36.4 cubic feet of space for a total 51.6 cubic feet. The middle row seating also folds flat for when you need even more space, exposing up to a huge 94.2 cubic feet of cargo space inside! The 2018 Cadillac Escalade has been cleverly engineered to subtly maximize interior storage space. Natural wood conceals the large cupholders until such a time as you need them. It also features a large center console storage area, complete with USB ports and for true power on the move, a 110v outlet. The Escalade can be ordered as the Escalade ESV, an expanded version for those requiring even more space and comfortable seating for up to 8. The doors on the ESV are even larger for easier access and egress, legroom is also increased for limousine-like comfort for rear passengers. As with the standard Escalade, the ESV features fold flat rear seats, only this time revealing up to an enormous 121 cubic feet of cargo space. The Escalade ESV even features a 9 inch color screen for third row passengers. Featuring the very latest in automotive technology, the 2018 Cadillac Escalade is s great to drive as it is to be driven in. Control is effortless, with a host of automation features, and wireless connectivity features heavily throughout. The available rear camera mirror utilizes HD camera technology to project video captured to the rear of the vehicle. This display is integrated in to the regular rear view mirror, but has the advantage of offering 300% greater field of vision than a traditional mirror alone. It can be activated and deactivated with just the flip of a switch. Cadillac truly thought of all eventualities with this tech, as is evidenced by the integrated camera cleaning system. Leveraging technology previously only found in fighter jets, the Escalade features a full color head-up display, projecting essential information onto the windshield, meaning you don’t have to take your eyes off the road for even a second. Cadillac’s CUE (Cadillac User Experience) Infotainment system provides an intuitive menu system, allowing effortless navigation of menus and control of the vehicle’s systems. Android Auto and Apple CarPlay form part of the experience, providing seamless integration between your smartphone and the car for easy access to music and phone features. The as standard wireless smartphone charging is both convenient and safe. Simply placing a compatible phone on the wireless charging station is all it takes, no fumbling with wires required. The Escalade also features an available 4G LTE WiFi hotspot, perfect for staying connected on the move, with capacity to connect up to seven compatible devices, everyone on board will benefit from this great feature. The available rear seat entertainment system puts passengers in AV heaven, with a 9 inch flip down screen, available headrest mounted screens, wireless headphones, and the ability to stream content from wifi enabled devices to share on the screens. The 2018 Escalade is available with a choice of four excellent trims, none of which should be considered a compromise, as all are outfitted with a huge array of great equipment. The amazing safety equipment suite on the 2018 Escalade is engineered specifically to enhance the driving experience without becoming irritating, or worse: a distraction. It all starts with the ultra-high-strength construction, the vehicle is built around a steel-alloy safety cage for incredible protection. The construction element is augmented by electronic and mechanical safety systems designed to detect and limit danger faster than the human alone eye could possibly register. The Escalade’s Surround Vision ‘bird’s-eye’ camera projects on to the CUE screen, giving you a full 360 degree view of your surroundings when the vehicle is driving at low speed or in reverse. This provides a great deal of special awareness to the driver when maneuvering in restricted spaces such as parking lots and driveways. The 2018 Cadillac Escalade can be fitted with Lane Keep Assist and Lane Departure Warning. These systems assist in collision avoidance by gently turning the wheel in the opposite direction should they detect that you have drifted towards a lane marker unintentionally. If you continue across the lane marker without signaling, the system can provide both audiovisual or physical stimuli to alert the driver in the form of a warning message on the display with a beep, or a seat pulse. You will still be in full control of your vehicle, as the system will not activate should it detect that you are actively steering, and can be overridden at any time, again by actively turning the wheel. The Lane Change Alert system, available in the Driver Awareness package, uses radar technology to monitor the blind spots either side of the vehicle, displaying an alert in the wing mirrors should it detect any other vehicle in the blind spots. The latest Cadillac Escalade is a stunning vehicle that must be seen to be truly appreciated. The thoughtful touches come together in perfect harmony, with features you didn’t know you needed, but once you’ve tried them you can’t live without. Premier Chevrolet Cadillac and your Ontario Cadillac dealers invite you to come and see this magnificent SUV. Call ahead and arrange a test drive, or simply drop in to the showroom for a tour of this incredible vehicle. Once again, if you’re looking for a Cadillac Escalade Ontario Dealer, call Premier Chevrolet Cadillac.